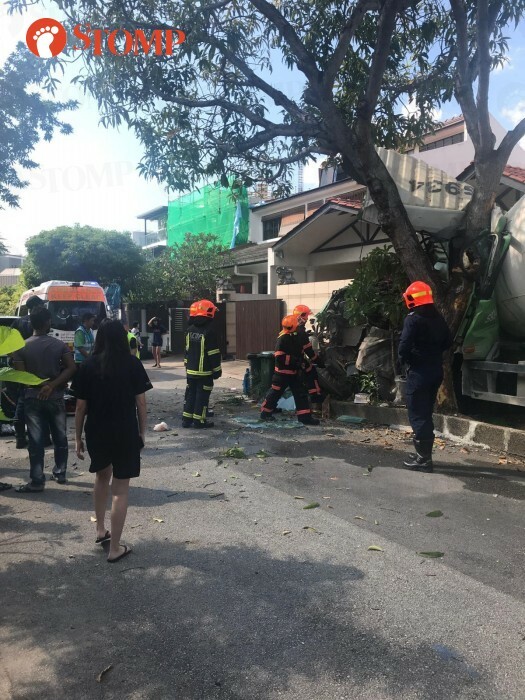 A 43-year-old man was taken to hospital after crashing a cement mixer truck into an electricity overground box in Serangoon Gardens on Saturday afternoon (April 6). The accident also caused a power disruption to 21 households. The police and Singapore Civil Defence Force (SCDF) said they were alerted to the accident at 67 Blandford Drive, towards Berwick Drive, at around 4.05pm. The truck driver was conscious when taken to Tan Tock Seng Hospital. Stomper Notthisagain, who was at the scene at around 4pm, contributed a video showing the driver sitting on the outside of the damaged truck. The truck can be seen wedged between a tree and a wall of one of the houses along the road while several toppled bins lay nearby. Photos also show SCDF offficers and an ambulance at the scene. A resident in the area told The Straits Times that the driver managed to climb out of the truck and was later seen sitting by the roadside. According to ST, workers from a tow truck company were at the scene at around 7pm, trying to dislodge the cement truck. SP Group representatives and NParks contractors were still there at about 8pm. An SP Group spokesman said the electricity overground box was damaged in the accident, leading to a power disruption to 21 customers at 4.19pm. Officers were immediately deployed to the affected area and electricity supply was progressively restored from 5.20pm. Power supply resumed at 6.15pm for all households except for one house that was blocked by the cement mixer truck. The house is currently unoccupied as it is undergoing renovations.